Tails ‘n Trails Half Marathon, 10K, 5K and 1-Mile Walk benefiting 3 non-profit rescue groups! 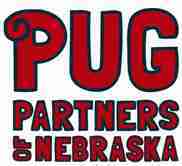 Pug Partners of Nebraska is a non-profit 501(c)3 organization comprised of dedicated volunteers who are committed to rescuing, rehabilitating and re-homing pugs in need. Our ultimate goal is to place each pug into a forever family that will continue to show the pug love, attention, and provide the care that they each deserve. We strive to educate our adopters and the public about our wonderful pug breed. Although pugs are quite different from most breeds, we want to show people how amazing these small dogs can be, and how they are great companions. Hands, Hearts & Paws is a non-profit 501(c)3 organization with a group of hard-working, animal-loving volunteers. We rescue pets from high kill shelters, puppy mills and homes that can no longer keep them. Muddy Paws Second Chance Rescue, Inc. is a 501(c)3, non-profit organization formed in 2014 by a small group of devoted animal lovers in the Council Bluffs/Omaha area with many years of rescue experience wanting to make a difference in the lives of dogs. Our rescue focuses on small breed dogs, less than 35 pounds of any age. It is all volunteer based and all of our rescue dogs are living in the homes of our volunteers. Our rescue is unique in that we offer supportive services such as education and training, to owners considering relinquishing their pet in an effort to try and keep the dog in their home whenever possible. We also educate and offer placement assistance to owners attempting to re-home their pets through social media sites, which can often be risky for the pets as well as the owners. Tails 'n Trails, (C) 2019. Made with puppy love at Content a la mode.